The shaded area represents where the sun is more than 12 degrees below the horizon. 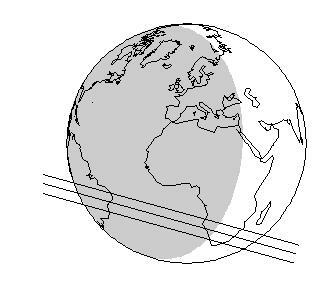 Across the globe pictured above, the three lines correspond to the northern limit, centerline, and southern limit of Varuna's shadow. The northern and southern limits correspond to a radius of approximately 480 km. 1The UCAC bandpass (579-642nm) is between V and R.
3All "offsets" are defined in the ("corrected" – "reference") or ("observed" – "calculated") sense. The offsets should be added to reference positions to get the measured positions, which we use to calculate the prediction. 4The reference positions for Varuna are those given by JPL Horizon's ephemeris (Pluto source file: JPL#13; Earth center source file: DE405). 5101 frames were used to develop a model to fit the residuals obtained from our measured positions compared to that of the object's JPL ephemeris.. The model includes the first-order effects of errors in the orbital elements of Pluto: (i) constant offsets in RA and Dec, (ii) linear (in time) offsets in RA and Dec, and (iii) sinusoidal terms with the Earth's orbital period. 6Varuna has a V magnitude of approximately 20.0. On December 7, 2008, Varuna will occult Varuna.20081207 (=2UCAC 40846256) The above map and the following prediction results are from the analysis of 101 frames obtained at the Lowell 42-inch Telescope, du Pont Telescope, SMARTS 0.9m Telescope, and Swope Telescope. 7Altitude of each observatory is measured in kilometers above sea level. 8"Distance" refers to the closest approach distance of the "Site" to the center of the object's shadow in the shadow plane. The errors on all closest approach distances are ±580 km (one standard deviation). "S." means the site is South of the center of the object's shadow. "N." means the site is North of the center of the object's shadow. 9The errors on all times are ±0:54 (54 seconds; one standard deviation). In parenthesis is the elevation of the body above the celestial horizon in degrees.